Amy Halloran. 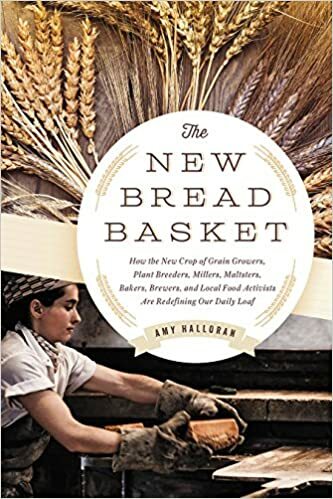 The New Bread Basket: How the New Crop of Grain Growers, Plant Breeders, Millers, Maltsters, Bakers, Brewers, and Local Food Activists are Redefining Our Daily Loaf. Chelsea Green, 2015. I missed this when it came out, but Chelsea Green just sent me a copy. I’m happy to have it, because it starts out by talking about the people behind the Community Supported Bakery (CSB) program I belong to in upstate New York around Ithaca: Stefan Senders’ Wide Awake Bakery and Thor Oechsner who grows and mills most of the grain for that bakery. Halloran interviewed many local and national people in the various categories of her book’s subtitle. If you want to know how and why there is now so much fabulous bread available in so many places in America, her book explains all. Bread lover that I am, I am grateful to all of them. And how is the fabulous Nathan doing that? By releasing Modernist Bread this week. Nathan Myhrvold and Francisco Migoya. Modernist Bread. The Cooking Lab, 2017. If you have a spare $600 or so, this 53-pound set of coffee-table books will make you happy. If you don’t, plead with your local library to purchase a set. The books are beyond gorgeous—lavishly illustrated and full of the facts, figures, and results of the Lab’s years of experiments on the history, culture, and deliciousness of bread and bread making. These books beg to be examined—but also used. That’s why they come with a 6th volume—a user’s guide. For that alone…. Jim Lahey with Maya Joseph. The Sullivan Street Bakery Cookbook. Norton, 2017. Jim Lahey of My Bread, No-Knead Bread, and Sullivan Street Bakery fame, has produced this marvelous cookbook with his wife, Maya Joseph, featuring all the great foods he serves at Co., his New York restaurant on 9th Ave @25th Street. Joseph M, Nestle M. The ethics of food. Lahey Clinic Journal of Medical Ethics 2009;16(1):1-7. Joseph M, Nestle M. Dialogue: the ethics of food [response]. Medical Ethics 200916(2):7-8. Joseph M, Nestle M. Food and Politics in the Modern Age: 1920 – 2012 In: Bentley A, ed. A Cultural History of Food in the Modern Age, Vol. 6. Berg, 2112:87-110. Maya is a superb writer and I can hear her voice throughout this book. The recipes are terrific and easy to follow and the book is beautifully illustrated. You can taste the recipes at Co. and then have some fun with them at home. Enjoy! I live part time in Ithaca, New York, where I participate in a bread CSA (a prepaid “Crust Fund”) run by Stefan Senders of Wide Awake Bakery shown here on a recent pick-up day (in space borrowed from a cake shop). His Mecklenburg-based bakery has quite a story—locally raised organic grains (mostly from Oechsner Farms), fabulous oven, baked to order—and its results are magnificent. I’m partial to the ciabatta…. Yesterday morning, post-election, I received an email from Steffan Sander, who bakes fabulous hard-crust bread in Tompkins County. He runs a bread CSA, to which my partner and I happily belong. I asked his permission to share his message. My heart goes out to each and all of you. Here we have been up till all hours, and then sleeping fitfully. Bakers do that anyway, but last night was different. We started the bakery a little more than five years ago. Why? Because we were hungry for good bread. Because we wanted to work and play with our dear friends. Because it seemed like the right thing to do at the time. But it was more than that. We built this bakery because we had a vision–of a place that would nurture our community, that would feed us all honestly and with the fruits of our shared soil and water. We saw the bakery as a place where skilled and hard work would be applied to simple materials, and that our work would then feed us all. We envisioned loaves shaped with care, each embodying our attention and love. We imagined those loaves shared and eaten, given away, or simply (if briefly) appreciated as a source of quietness. Nourishment. There have been days–too hot or too long or too dry or too wet–when all of that has seemed a dream. But this morning, I feel it more strongly than ever. What I saw last night was half a country intoxicated by the pleasure of finally being allowed to openly express anger, resentment, and hatred. It is that awful pleasure that concerns me. I do not think it will subside anytime soon. There will be plenty of work to do in the weeks and months to come. For now, I wanted to tell you this about our bakery: we rededicate ourselves to kindness, to generosity, to difference, to complexity, to respect, and to reason. We rededicate ourselves to hard work, to vision, and most of all, to love. This is why the food movement matters and is such a source of hope—and pleasure. Marty Gitlin and Topher Ellis, The Great American Cereal Book, Abrams 2011. I love cereal boxes, especially ones with egregious health claims, and I have a small collection dating back ten years or so. I also, courtesy of Kellogg, have facsimiles of the complete set of Rice Krispies, All-Bran, and Froot Loops, dating back to the first year they were produced. So I’m delighted to find this history of U.S. breakfast cereals, organized alphabetically by era starting in the 1860s, illustrated with pictures of each. A encyclopedic nostalgia trip! Aaron Bobrow-Strain, White Bread: A Social History of the Store-Bought Loaf, Beacon Press, 2012. Bobrow-Strain organizes this books by dream categories: dreams of purity and contagion, control and abundance, health and discipline, strength and defense, peace and security, resistance and status. White bread does all this? Indeed it does in this story of how “white bread became white trash.” He begins by asking, “Is this stuff even food?” He ends with the whole wheat phenomenon and “yuppie bread.” This is entertaining history and an example of food studies in action: using food to talk about important issues in history and contemporary society. My first-Sunday-of-the-month San Francisco Chronicle Q and A column, Food Matters, is out. This month it’s about figuring out what “whole wheat” labels mean on food packages. Q: I pay $4 for multigrain or whole wheat breads because I’ve heard white bread isn’t as healthy. But when I compare nutrition labels, $2 white breads look much the same. Are they? A: My Talmudic answer: yes and no. You are asking about commercial sliced breads. Bread may be the staff of life, but you would never know it from reading the ingredient lists of most commercial products. Commercial breads are indeed much the same, with only a few differences that matter. To decide whether these have anything in them worth eating beyond their calories, you must inspect labels to make sure the first ingredient is whole grain, the total number of ingredients is small and devoid of unpronounceable chemicals, the fiber content is at least 2 grams per 1-ounce serving and the label says 100 percent whole wheat. Anything less is reconstituted white bread with occasional pieces of the original grain added back. And then there is taste. Artisanal breads begin with just four ingredients – flour, water, salt and yeast – and turn them into loaves so crusty, chewy and fragrant that you cannot stop eating them. If they have some whole grain in them, even better. But handmade breads take forever to make and quickly go stale. Commercial bakeries deal with these problems by rushing the bread-making process and compensate for the loss of flavor by adding stabilizers, dough softeners and preservatives, and covering up the chemical tastes with sweeteners. Breads with 30 or more ingredients are not unusual and violate my rule: Never buy processed foods with more than five ingredients. To compare breads, you must read labels. Bread companies do not make this easy. Some list the serving size as one slice, some two, and their weights can vary by twofold. When you convert everything to ounces, the nutrient content of supermarket breads looks much alike. An ounce provides 70 to 80 calories, a trivial difference. The grain is what counts. Wheat grains have three components – the nutrient-rich bran and germ (“chaff”), and the endosperm, which is mostly starch and protein. One hundred percent whole wheat flour contains all three in the same proportion as in the original grains. White flour contains about 80 percent of the original components. It is mostly endosperm. Nutrients in the chaff are lost, so bakers are required to replace the five nutrients least likely to be available from other foods: niacin, riboflavin, thiamin, folic acid and iron. The others are not replaced. Neither is fiber. White flour contains only trace amounts of fiber. Because high-fiber diets promote healthy bowel function and appear to reduce risks of heart disease and bowel cancers, dietary advice is to eat at least three daily servings of whole grains – 3 ounces of 100 percent whole wheat bread, for example. Food labeling rules do not make it easy to figure out fiber content. Some white breads list 1 gram of fiber, but watch out for serving size. It takes two slices to reach half a gram, which can be rounded up to 1. Whole wheat bread with 2 grams of fiber per 1-ounce slice may have four times as much fiber as white breads. But watch out for breads listing 3 grams fiber; their slices may weigh nearly 2 ounces. In response to dietary advice, commercial bakeries have introduced whole grain breads acceptable to white bread eaters. These grind the wheat bran super fine, add extra dough conditioners to keep the bread soft, and toss in some bran or cracked wheat to make the bread look like whole wheat. Check for fiber grams and the position of chaff ingredients on the list. The further down the list, the smaller their contribution. The FDA’s nonbinding guidance says anything labeled “100 percent whole grain” must contain all three components of the original wheat seed, in proportion. This regulatory gap permitted creation of the industry-sponsored Whole Grain Council. The council issues a certifying stamp in two forms: 100 percent and Basic. One hundred percent means all grains are whole. But the more prevalent Basic stamp allows refined grains and disproportionate additions of bran or germ. This article appeared on page K – 3 of the San Francisco Chronicle. Note: E-mail your questions to food@sfchronicle.com, with “Marion Nestle” in the subject line. Read previous columns at sfgate.com/food.